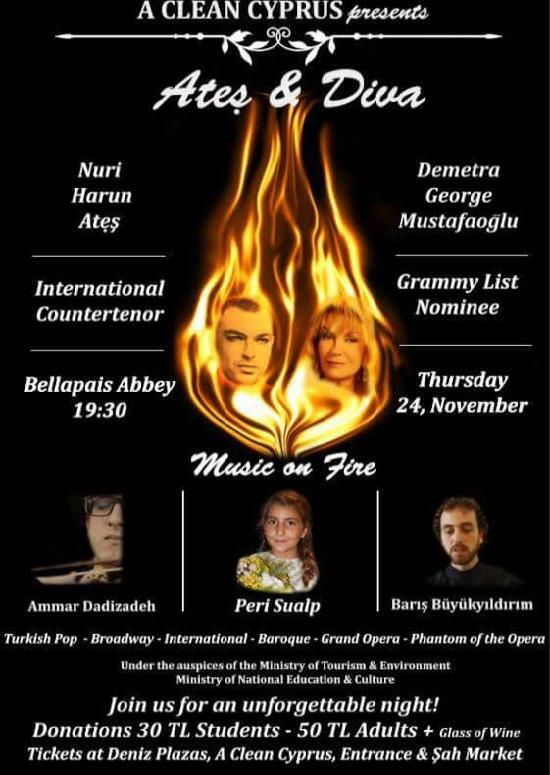 Fabulous rehearsal today with Ammar Dadizadeh our FIDDLER for ATEŞ & DIVA Nov. 24 at Bellapais Abbey 19:30. Your favorites of PHANTOM, CARMEN, BUTTERFLY, TRAVIATA, HOFFMAN, KISS ME KATE, MY FAIR LADY, EVITA, LES MIS, LITTLE MERMAID, SOUND OF MUSIC,WIZARD OF OZ, SOUTH PACIFIC, KISS ME KATE, Baroque music & GREASE. Costumes, sets, lighting as never before!! 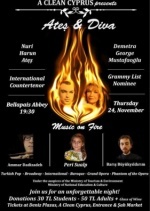 Tix at Şah Marketplace, Deniz Plazas & abbey. Wine for our guests! MUSIC ON FIRE! Joining us again from the Bedesten concert last year is fabulous flutist Burak Besir!